At the end of the gifting season, I’ve amassed a collection of wine, biscotti and pasta sauces, courtesy all the people and organizations I am in touch with through the year. Ferrero Rocher chocolates never come amiss, no matter what the time of year, neither do panko crumbs and jars of Ragú sauce. I do wonder, however, how long it is going to be before regional Indian ingredients make their way into hampers from five-star hotels and upmarket restaurants. I have just returned from a trip to Pune and Mumbai, where I searched the highways and byways for little-known spice blends and came back with a rich stash. Alaka Hudlikar, the friend of a friend in Pune, had nothing but scorn when I told her that I planned to buy Goda masala from the venerable P.Y. Vaidya. Hudlikar has the wherewithal to pound her own Goda masala annually, that too in a mortar and pestle. However, Vaidya runs what is arguably the most trusted spice shop in that city. I grabbed the first packet of Goda masala I could find. There is indeed a vast gulf between the sample that Hudlikar graciously gave me and the packet that I bought from Vaidya. 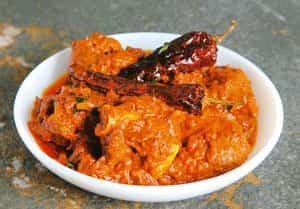 Integral to Maharashtrian Brahmin cuisine, the best versions are reportedly to be found in Pune, simply by virtue of it being the stronghold of Brahmins from that state. Hudlikar’s own version has an underlying note of dagad phool (lichen) and no dried grated coconut because she doesn’t want the coconut to turn rancid and spoil the blend, so she adds freshly roasted, dry, grated coconut to the blend every day. The hotel I stayed in—Shreyas—turned out to have a really famous dining room, specializing in thalis of the Brahmin community. Their version of Goda masala, going by the taste of their amti, or yellow lentils, packed a mean punch with dagad phool being the most assertive spice in the blend. You add Goda masala to any number of dishes, including steamed rice, lentils and a few dry vegetables. The other spice blend that I found—in Mumbai, not Pune—was Kolhapuri masala. I bought it from Sahakari Bhandar and the packet was so poorly printed that I couldn’t figure out the brand name. It was a single-serve portion and it made the best mutton curry that I have had for a while. However, the dark horse of the trip was Farida Virani, housewife and member of the Ismaili community (022-26452876). The spice blends I bought from her house in a leafy lane in Bandra were outstanding, especially the kaari masala, a besan (gram flour) and sesame mix with a hint of cardamom. You make a paste with it, sauté the paste and add pre-cooked chicken or lamb with water. Topped with the birrista (onion slices fried golden and crisp) that Virani sells in packets, it makes an unusual dish, and one that I have never heard of or even encountered elsewhere. But gifting ingredients to cook regional Indian specialities is virgin territory for businesspeople on the lookout for new ideas. And Mumbai really is the richest city with its plethora of ethnic varieties. Marinate the mutton with turmeric, a bit of the oil and lemon juice and set aside. On a slow fire, put the unpeeled onion and coconut on a direct flame till both are blistered from outside. Remove onion skin and thump with your fist till it is squashed. The onion is now sweet rather than pungent (one of nature’s secrets). Grate the coconut and set it on a thick-bottomed vessel to brown as much as possible, stirring periodically. Next, grind the coriander seeds, cumin, black pepper and sesame with the green chillies and coriander leaves. Sauté the mutton in the remaining oil, add all the ingredients and cook till the characteristic dark cinnabar colour is attained. Add just enough hot water to make a thick gravy (between half and one cup) and pressure cook for two-three whistles or until done. This is an extra spicy dish, but feel free to vary the chillies according to individual taste.